COSMOSAPIENS is the groundbreaking book that transforms our understanding of what we are, where we came from, and why we exist. Chosen by two reviewers as Book of the Year in The Times Literary Supplement. Selected as one of The Best Science Books of 2015 by The Telegraph (UK). concludes that, uniquely as far as we know, we humans are the unfinished product of an accelerating cosmic evolutionary process and the self-reflective agents of our future evolution. Published in the UK by Duckworth. Or via Amazon UK as an audiobook. Published in the USA by The Overlook Press. Also available via Amazon India. A 700-page description of the state of current scientific knowledge about the origin of matter, life and humanity, plus a bold attempt to assess its limits. It is lucid and intelligible to the non-specialists—Hands was originally trained as a chemist, but has also published three novels. This is a book of astonishing ambition and scope, more like the work of a great Victorian polymath than most popular science books. Argues that mind and matter evolved in unison and, one day, human consciousness and the star-filled universe will be revealed as part of the same cosmic whole. Such ideas were lapped up by the 19th-century followers of Hegel and it is both shocking and invigorating to hear them stated again…in the context of a quantum universe. A substantial, sceptical survey of the current state of scientific knowledge of about the most basic questions… (Hands) is always fair, and he writes from what must be the best point of view for a scientist—he is a dispassionate agnostic about everything, except those few things which can fulfil Popper’s falsification principle… An invaluable, encyclopedic achievement. It would scarcely be possible, without Hands’s own overarching perspective, to grasp the central reality of contemporary science…an irresoluble tension between the awesome achievement of science in the recent past and the compelling signs that for all that we might learn there is, after all, more than we can know. COSMOSAPIENS is, as Cambridge Professor of Philosophy Tim Crane has commented, ‘a truly remarkable work’ – as indeed it is – dispassionate, even-handed and, informed by the author’s extensive correspondence with more than sixty specialists across the entire range of scientific disciplines, immensely persuasive. In this audacious, ambitious, and philosophically completist study, Hands leads an interdisciplinary search through all the current human knowledge that may help answer two burning questions: What are we, and where do we come from?… The result is a pearl of dialectical reasoning between Hands and the most celebrated experts he can find. In today’s age of specialization, readers will welcome this throwback to the days of the well-informed layperson, conversant and opinionated in a variety of topics… Hands grounds his musings in logic and scientific fact to produce a thoughtful treatise for the eternally curious. From dark energy to the selfish gene, Hands looks at how we know what we know—and what we don’t. An overview of thought on this ever-fascinating subject. Hands’s book is a game-changer. In the tradition of Thomas Kuhn’s The Structure of Scientific Revolutions, this lucidly written, penetrating analysis challenges us to rethink many things we take for granted about ourselves, our society, and our universe. It will become a classic. 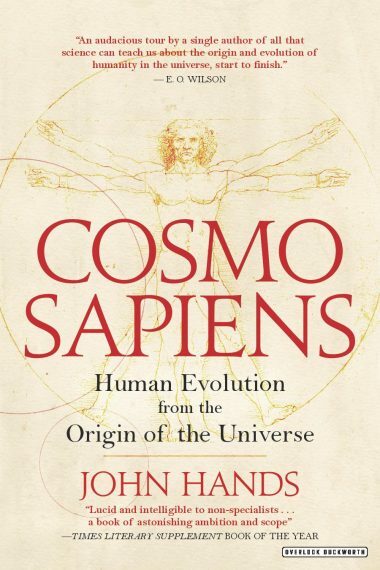 John Hands has attempted a remarkable thing: nothing less than an exhaustive account of the current state of scientific knowledge about the origins and evolution of the cosmos, life and humanity. His driving questions are those that have inspired all of science, religion and philosophy: What are we? Where do we come from? What is the source of consciousness, value and meaning?…This is a truly exceptional piece of work. John Hands is an astute observer of recent trends in scientific ideas bold enough to point out what he sees as sense and nonsense and intelligently explain why. Even in cases where one might disagree, the arguments are thought-provoking. COSMOSAPIENS is an audacious tour by a single author of all that science can teach us about the origin and evolution of humanity in the universe, start to finish. Its encyclopedic sweep can be read straight through or browsed in parts of special interest. There have been numerous books seeking to tell a tale that opens with beginning of our universe and, after a long, dry journey, concludes with ‘the ultimate’ event: the emergence of our species, Homo sapiens. None has done this better, more clearly, and with greater thought and documentation than John Hands. But he goes on to conclude that, uniquely as far as we know, we are the unfinished product of an accelerating cosmic evolutionary process and the self-reflective agents of our future evolution. A work as bold, broad, and challenging as this will no doubt tweak the bias any one of us may have regarding a particular event, but, then, so did Darwin’s On the Origin of Species. A magisterial, persuasive and thought-provoking survey of the horizons of modern science. This book is an intellectual tour-de-force: a review of about all the major scientific theories that purport to explain origins of the universe, matter, life and mind. The approach is refreshingly agnostic…in a clear and readable language…highly recommended for anyone wishing to get a deeper insight into the fundamental but typically arcane theories that purport to explain where we and the universe that surrounds us are coming from. It often takes an outsider to see the limitations of conventional science. As far as biological evolution is concerned, John Hands has done a remarkable job of disentangling the many topics that are long overdue for reinterpretation. The enormous effort he has made to cover so many evolutionary questions is heroic… A major accomplishment. Any conventional Darwinist (and I am one of them) will find a lot to take exception to: but disagreement is the fuel of progress and if you enjoy an argument this is the book for you. An audacious and admirable book…written with engaging style, and the strongest scientific ideas across a swathe of fields in physics and biology are presented lucidly. With depth and virtuosity, John Hands explores the Big Questions of human existence: who are we? why are we here? where are we headed? …Hands’s voyage of inquiry will not only educate you, it will also surprise. A fine book… brave, very wide ranging, synoptic. John Hands…came to realise, and makes us realise, how much we don’t know. Nevertheless, he is optimistic, and when he comes to human evolution and a schematic view of our history, he is hopeful and sees progress in understanding and co-operation. From his book we get that big picture he sought.